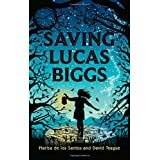 Saving Lucas Biggs by Marisa de los Santos and David Teague. Possibly another time traveling Newbery in the works! The O'Malley family has a trait that allows them to travel, but they are sworn to not use it because of the havoc it can create. Four O'Malley generations figure in the present and history of a mining town plagued with accidents and tyranny. The current murder trial of a geologist working for the mining company dredges up memories of another murder trial of a union worker and leader. In both cases, the trial was overseen by employees of the company, Victory Fuels. Fairly quickly, facts are divulged about the connections of the two incidents. The judge of the current case is the son of the accused from the earlier case. As a boy, he was taken in by the owner of the mines and raised as a successor. Rehashing the past might make a difference to the man currently accused, an O'Malley. From the beginning, we watch both stories unfold. O'Malley's daughter is convinced by an old friend that the past holds the answers. She attempts to travel alone and meets an old O'Malley relative in the process, another traveler. The stories intertwine increasingly as time proceeds. One visit isn't enough, and try as she might, Margaret's efforts don't seem to accomplish anything, accept the knowledge that she gains through the experience. Enough knowledge that her present actions, and her friend Charlie's, may be the saving acts. Social issues play a big part in establishing place and circumstances, maybe too much for some people to enjoy it as much as I did. The characters are a part of the appeal to me. Particularly Grandpa Joshua (also a boy in previous time period), Aunt Bridey (O'Malley), and Aristotle (the union leader). There are also some ties and unique details that add flair to the experience. The intertwining elevates it as well, mixing the current murder mystery with the historical social setting, but twisting it at the same time. The traveling doesn't change enough happenings that it would be considered silly. More a vehicle for seeing into the past and making it more real. ©2006-2016 BookAdvice.net. Advice, banner, and coding help given by Redwall_hp. Established May 2006.